Yes, I know, I thought it was a joke too. Just to clarify, as far as I know, Ed Miliband’s wife Justine Thornton isn’t a Muslim either. As a satirist – I just LOVE the UKIP. Makes yer sick don’t it? This piece just shows the weird paranoia and conspiracy theorising at the heart of UKIP. Bliar wasn’t a Muslim. He was an Anglican, who converted to Roman Catholicism. He claimed he read the Qu’ran, which got him some kudos with British Muslims. Apart from this, he also had very New Age-y beliefs, like the time he and Cherie decided to renew their relationship in some kind of weird mystical ceremony inside a modern, replica pyramid in Mexico. And then there was the story of Peter Mandelson and his Brazilian boyfriend consulting a South American shaman to protect themselves from spells cast by Charlie Whelan. If you’re looking for non-Christian spirituality at work in New Labour, then it’s probably modern occultism rather than Islam. As for any long term plan to place Muslims in power in Britain, there really doesn’t seem to have been one. The Conservative Christian religious blog, Cranmer, had a special animus for Gordon Brown, not because he was an atheist, but because he was the son of a Scots Presbyterian minister. And Miliband is an atheist of Jewish heritage. The closest I can see him being to Islam is that he annoyed Maureen Lipman for not being as pro-Israel as the she felt he should. 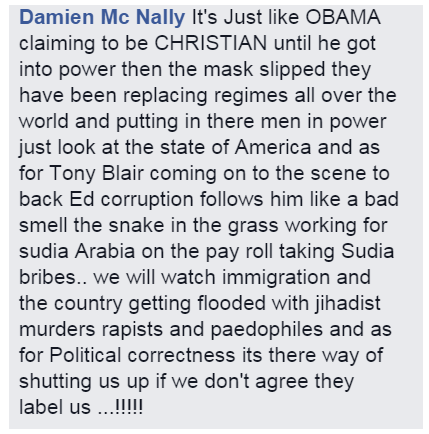 This whole affair also shows the pernicious influence of the American extreme Right, particularly the weird belief that Obama is a secret Muslim. He must be a Muslim, because he’s half-African, he’s got Muslim relatives, and when he was in Indonesia, his religion was stated as Muslim. And this takes precedence over all the evidence that as an American, in America, he was and is a Christian. There’s a meme out of there saying ‘Obama is a Muslim, Communist and Nazi. Seriously, he can’t be all three’. Which pretty much shows how ludicrous it all is. As for placing Islamist regimes in power, that was all set in motion by George Bush. Bush and the Neo-Cons claimed to be democratic revolutionaries. Deposing Saddam Hussein in their view was the first step to creating a modern, secular, democratic Middle East. What they ignored is that it’s the dictators who stand for secular liberalism. Once you depose them, large numbers of the ordinary population want the return of Shariah law. And if we are talking about politicians in the pocket of the Saudis, that’s actually George Dubya again. At one of his meeting with them, Dubya went walking about holding hands with one of their princelings. He’s so close to ibn Saud family that he was even nicknamed ‘Bandar Bush’. And there’s a reason they want to keep the Saudis sweet. The Saudis demand that their oil is paid for in dollars, which keeps the American economy afloat and allows them to engage in policies, that would sink those of other nations. The moment the Saudis decide that the oil has to be paid for in another currency, Pounds, Pesos, Francs, Marks, Yuan, whatever, is the moment that the US economy takes a massive hit and capsizes. And it was partly to enrich the Saudis and the rest of Big Oil that we and the Americans invaded Iraq. Iraq supposedly has the second largest oil reserves after Saudi Arabia, which the Saudis and Americans both coveted. They also wanted to stop Saddam Hussein destabilising the oil market by one day flooding it with cheap oil, and the next cutting back. And when we come to the country being flooded with Jihadi murderers and rapists… well, the rapists seem to have been born here, but many of the jihadis were imported from Afghanistan by Maggie Thatcher. Thatcher gave them sanctuary during the proxy war against the Soviets when the mujahidin, including one vile character, who blew up a plane full of schoolchildren going to Moscow. But all this is forgotten, as it’s Maggie Thatcher, who in the eyes of the Right is far more infallible than the Pope could ever hope to be. An additional, hidden element in this fetid stew is the weird belief, again manufactured by the extreme Zionists in the American Republican party, that Socialism = Nazism. Frederick Raphael went on a rant in the pages of the Spectator in about 2004 reviewing a book that predicted that in the near future, the remains of European Socialism will get into power with the Muslims and begin again the holocaust against the Jews. We’re back to all the rubbish about Eurabia and the Muslim demographic threat. 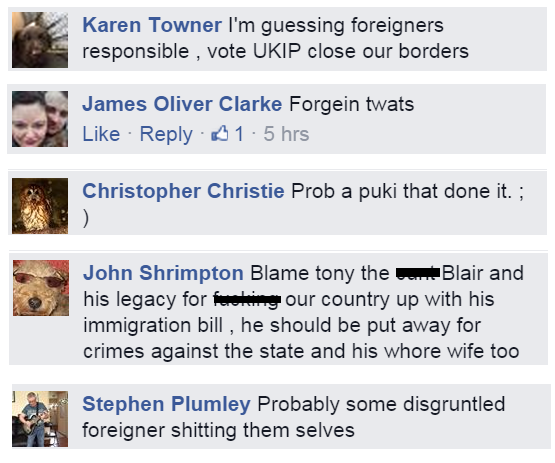 And that seems to have found its way into UKIP as well. There was a Nazi video on Youtube a few years ago, which predicted that in 2020s there would be a European civil war between White nationalists on one hand and an alliance between the Socialists and the Muslims on another. 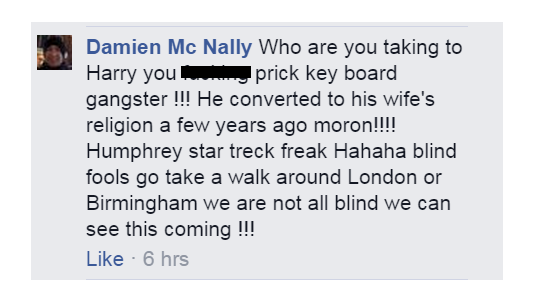 There was a scandal, because one of the Kipper councillors in the West Country actually believed it, and started ranting about it on the internet. He was forced to stand down. This doesn’t seem to have ended the mad theorising, as McNally’s post shows. If the Kippers get any more right-wing, they’ll just have to go all the way and start forming their own militias and armed compounds to protect themselves against the Socialists/ Muslims/ Zionist Occupation Government/ Anybody Who Looks A Bit Foreign. Well what can you say-really? @Ruth you may be correct in that assumption as in some cases it’s almost word for word as the Ukrap stuff both suffer from that drooling at the mouth lunacy. Whomever God wishes to destroy is first driven mad. The gift that goes on giving and knows not how to stop. Is a puki just a pukka Pakistani?